The cabinets in your kitchen provide a wide range of benefits within the home, from holding your panoply of dishes to tying the entire space together with a stunning appearance. While these products are an integral part of your daily life, their heavy use can quickly lead to minor annoyances and aesthetic imperfections. Everyone’s cabinetry behaves differently, with some homeowners dealing with stuck drawers that never open and others who have to put up with loud, slamming cabinet doors. Replacing your kitchen cabinets can prove to be a wasteful and very costly endeavor, delivering amazing results that may have been obtainable through more efficient methods. Detail Design & Remodeling is here to provide the best cabinet refacing to Atlanta and beyond, delivering quality results each and every time. Our experienced home remodeling contractors have the experience to deliver amazing results in your kitchen, delivering a comprehensive set of services to ensure a quality outcome. We’re here to help create the most beautiful kitchens in Georgia, and our cabinet refinishing services are ideal for a wide range of homes. Our cabinet resurfacing services are ideal for restoring your old cabinets with a durable, beautiful facelift. If your cabinetry is worse for the wear, numerous problems may pop up that can hamper your access to a wide range of kitchen products. 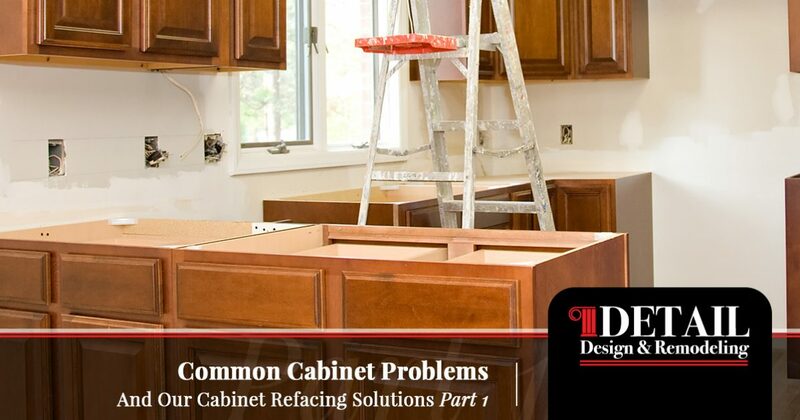 Today, we’ll highlight a few of the more common cabinet problems people face, as well as a few handy solutions. If your home is in need of cabinet services, be sure to reach out to our experts for assistance! Doors that swing up or simply won’t stay closed can be very annoying on a daily basis. In some cases, this issue can create safety concerns (for falling dishes and for bumping your head!) that need to be addressed quickly. In many cases, the hinges on your cabinet doors will not hold in place if one or more screws are loose, creating an unbalance that places a lot more weight on the remaining screws. Go through your cabinets and ensure that each screw is snug and secure on both your doors and box faces. 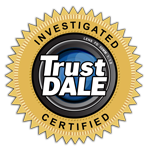 If securing the hardware does not remedy the problem, you may need to check to see if your cabinets are level. If not, it can pay to reach out to cabinet repair experts such as Detail Design & Remodeling. Nothing sends your good day into a spiral faster than having a drawer that simply won’t budge. Luckily, this DIY project is often very simple and cost-effective. To begin, remove the drawer in its entirety to expose the tracks that guide your drawer in and out. In many cases, the sliding equipment of your cabinetry is bogged down with dust and debris, causing friction that can jam up your daily opening procedure. Be sure to clean both the slide and tracks thoroughly, wiping each component down and drying it. The next step is to apply a lubricant (WD-40 is a popular choice) along the contact points to ensure smooth movements. If the tracks in your drawers are bent or damaged in any way, you can benefit from affordable replacements. Many homeowners are plagued with loud cabinets that constantly slam shut. Instead of adjusting your movements to allow for gentler operations, you can invest in a number of solutions. One quick remedy is to install bumpers that act as an air cushion, softening the impact and vastly reducing any slamming noises. Homeowners who are looking for a fancier solution can invest in higher-end hardware that involves the use of an adapter. These door dampers can be adjusted to customize the speed at which you want your doors closed. Home cabinets put up with a lot of abuse over the years, and the daily usage will likely lead to a varying number of quirks and damages. Next time, we’ll highlight a few more common problems homeowners suffer from with their kitchen cabinets, as well as the value that our cabinet refinishing services provides. Detail Design & Remodeling is proud to be your source for the best cabinet refacing in Atlanta, delivering amazing results that are as economical as they are affordable. If you want to learn more about our cabinet refinishing services, be sure to call us today!